Portraits of women in the 18th century were most often commissioned by men - fathers, husbands, brothers or lovers - so this painting is unusual in that it was almost certainly commissioned by the sitter herself. Frances Abington (née Burton) was one of the most celebrated actresses on the Georgian stage and Reynolds’s several portraits of her – and prints after them – played an important role in the cultivation of her public image. Here she is depicted in the guise of Thaïs, the ancient Greek muse of Comedy, presented as the flesh and blood counterpart of the stone statue of the muse, against whose plinth she leans. The actress holds the mask of Comedy in her right hand and gazes boldly out at the viewer. 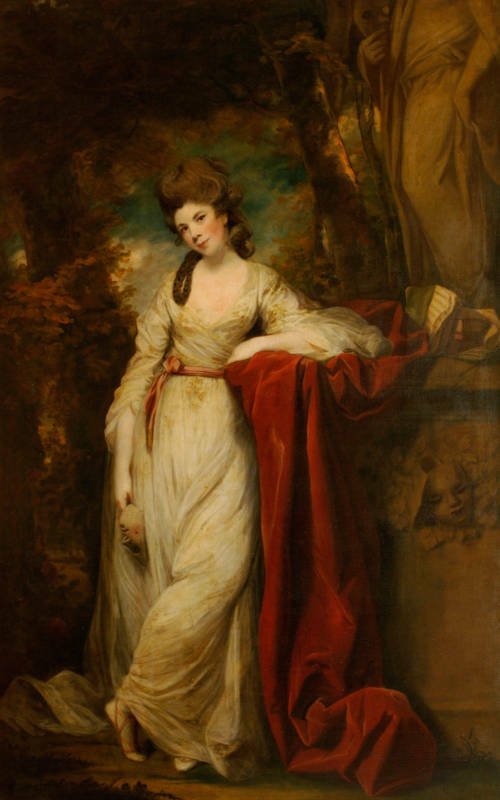 Abington was a highly visible leader of London fashion and it is not surprising that she sent the portrait back to Reynolds a few years after it was painted, so that the dress and hairstyle could be updated. Comparing the painting with a mezzotint of how it looked before these changes, one can see that Reynolds made the sprigs on the dress less pronounced, creating drapery in line with the more classicising styles of the early 1770s, and restyled the hair.